Agenda writing may seem to be a waste of time to some, but once you know what benefits it can give to you, it might change your mind. Agenda is applicable to any activity, event or event in our daily lives. It only takes a person to realize why it’s important. Agendas can be like programs. 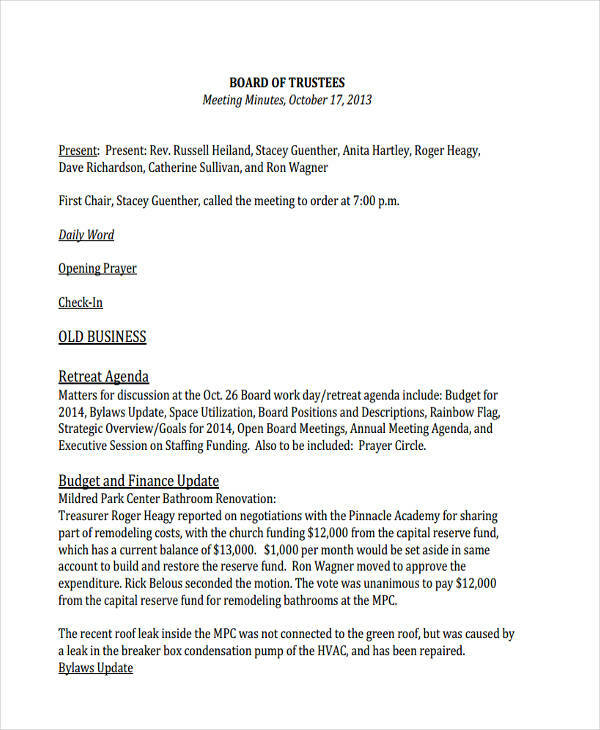 For meeting agenda, that would be a different case. 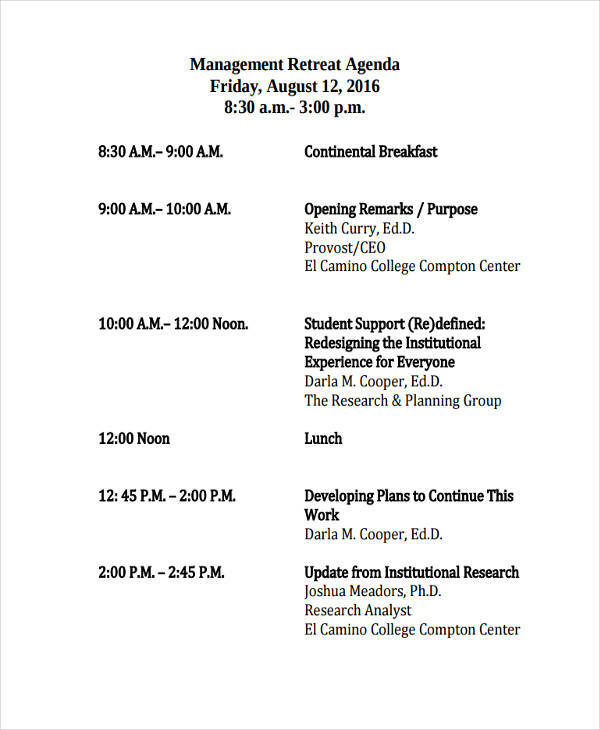 Agendas can be very useful for retreats, school events, and trips. Trip agendas have been used mostly on tours. Nevertheless, retreats of any institution can make use of it. Check these samples below. 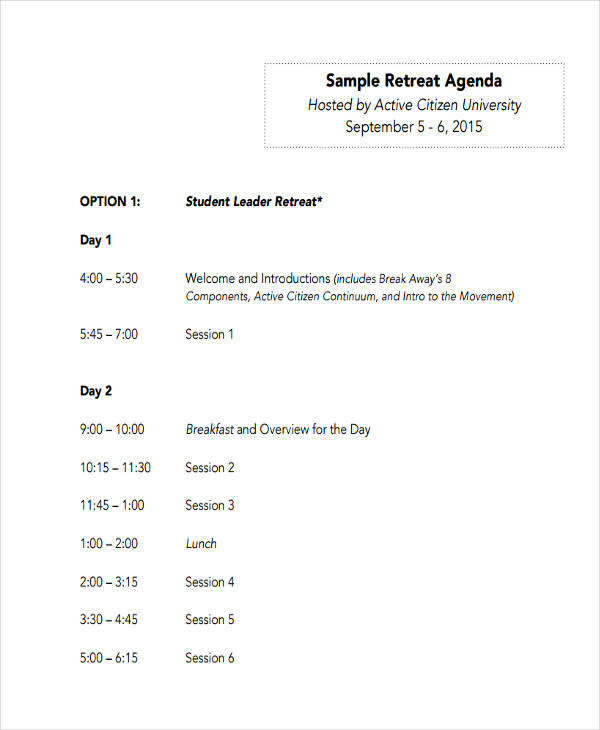 What Is a Retreat Agenda? 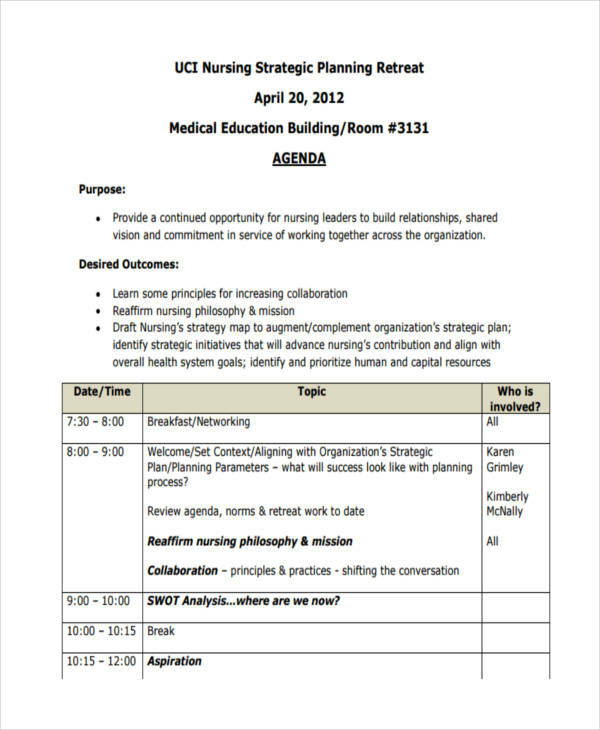 Retreat agenda examples are specifically agendas prepared for an institution’s retreat. This event may be for students, staff members, or any group of people. A retreat is a time when a group of people can build relationships, share their views and visions with other members of the organization they are in. 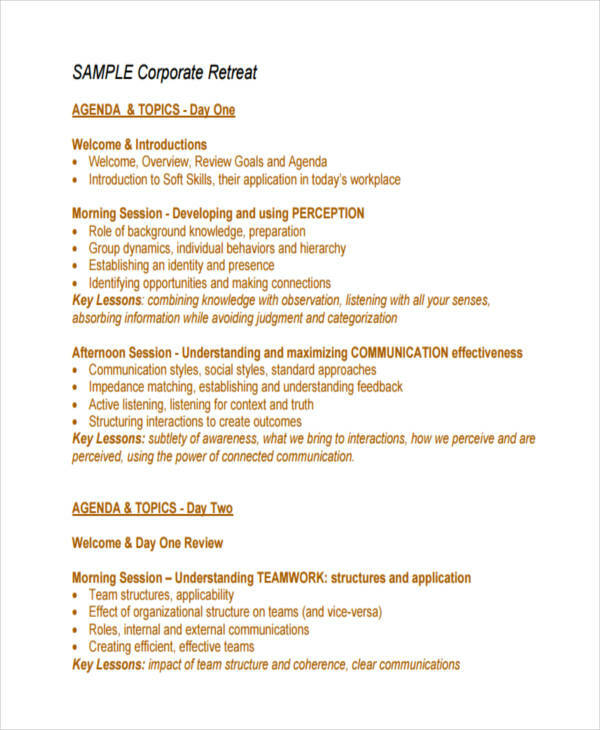 A retreat agenda is an organized set of activities programmed to “draw back” employees or staff member from their day-to-day activities in work. Looking closely at agendas prepared in Excel, for example, retreat agendas have a specific time frame for every activity planned. Determine what issues to cover for the retreat, in their allotted time and in a suitable order. Conduct a survey that can be possibly be part of the activities in the retreat agenda. Include brainstorming activities for the whole team to build a sense of team contribution. 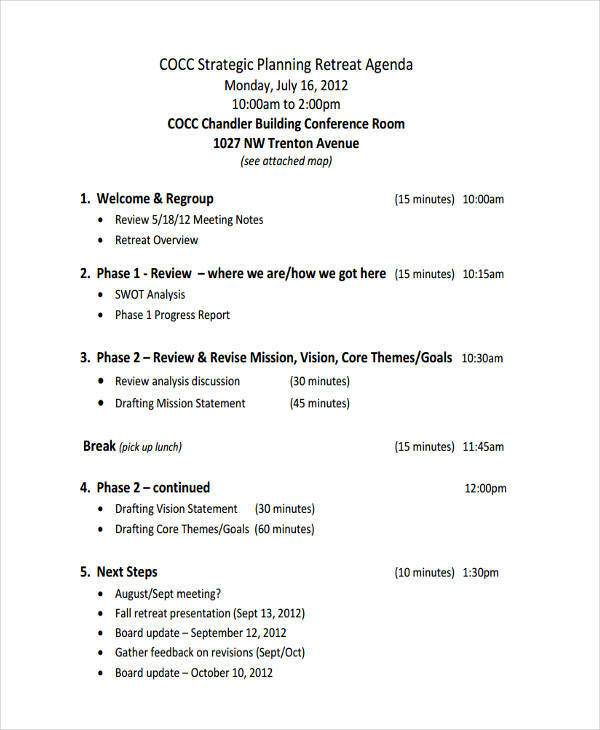 Ask a facilitator to help plan for the activities in the agenda. For more ideas, you might find it useful to look through these examples that best fit your situation. Having a retreat for staff members for nonprofit organizations help staff members relax for a day. Resting (productively) from all those days working can help one to be more productive. 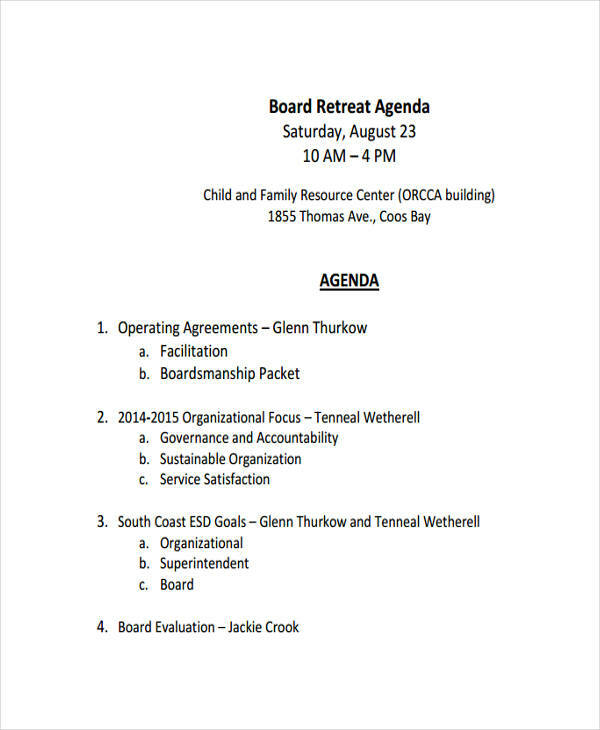 Why Retreats and Retreat Agendas? Retreats aim to help the people in the organization increase work efficiency and productivity. Retreats can also be like a team building to help people in the organization more effective as a team. 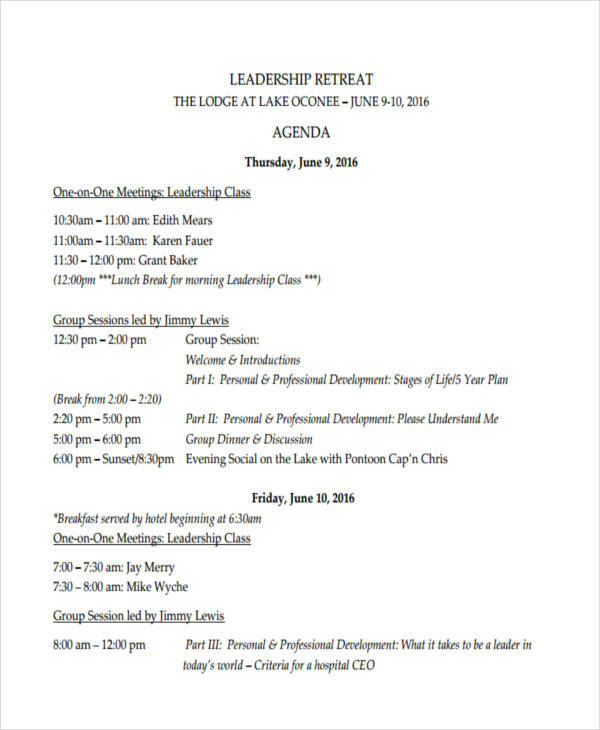 Just looking at agenda examples can inspire you to organize a retreat. 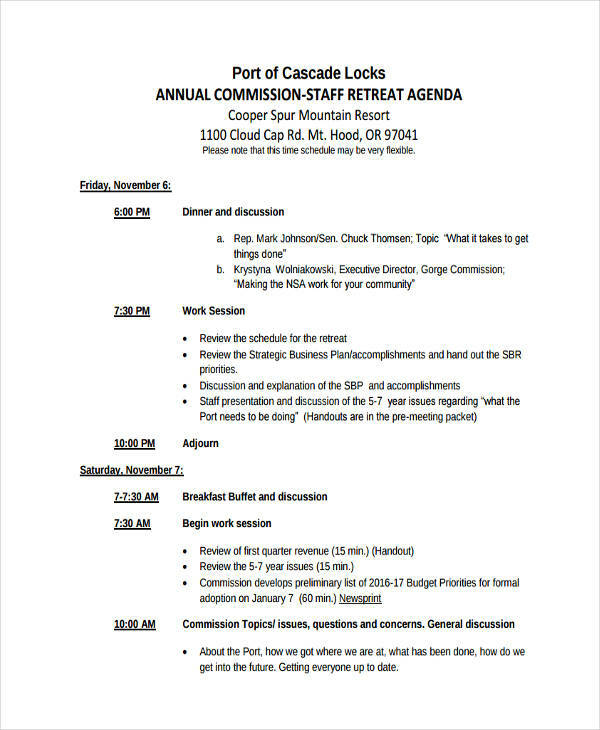 Agenda Examples in Word format can be easily adopted and modified for use right away. You will need a retreat agenda for strategic plans and to be more effective in your budgeting and time allocation. They may also help develop more effective organizational goals and objectives.